It'd be understandable to initially confuse Kiwi Jr.'s Leslie as an obscure, early-eighties I.R.S. recording. But let me stop you before you hop onto YouTube in search of any long-lost archival footage—the Southern-tinged jangle-pop track comes from four Prince Edward Island musicians who now call Toronto their home. Leslie is just one of the sly, yet rickety tracks found on their debut full-length album, Football Money. 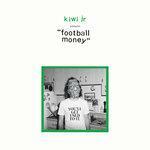 Just shy of the 28-minute mark, Football Money is a sharp-witted collection of the band's observations living in a big, lively city. There's no shortage of droll observations—they imagine the everyday ennui of a depressed corporatist over an Orange Juice-like bounce (Salary), complain about an acquaintances' incessant banter over surfy punk-rock (Nothing Changes), and reflect on their relationship fumbles as they inhale secondhand smoke over shimmering jangle chords (Comeback Baby.) There's no time for ruminating, as singer-guitarist Jeremy Gaudet goes from one deadpan one-liner to the next—sometimes within a single verse— with unaffected candor. Gaudet's weary sing-speak has drawn comparisons to the likes of Stephen Malkmus, though that's where the comparisons should end. In fact, Kiwi Jr.'s multi-laced power-pop is practically antithetical to his band Pavement's carefree, effortless precision. The band like to wrap their hooks within intricate arrangements that always land right when the chorus starts—the title track follows the winsome, jittery punch of Repercussion-era The dB's, while the nervy, chiming Gimme More bears more of a resemblance to 90s Pavement acolytes Urusai Yatsura. Whether it's intentional or not, how's that for knowing your influences inside-out. Still, Kiwi Jr. injects loads of personality into their crafty, guitar-driven rock. The band brings a vigorous energy to their quirky sentiments as they walk through their surroundings, instilling a comical bent at any opportunity. Even if they know that the farther they go, the better it is to stop for a second and just be in the moment.